Nippon Yusen K.K. 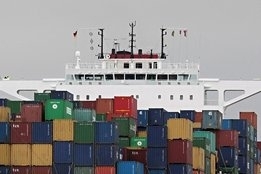 (NYK) is looking to send a remote-controlled box ship from Japan to North America in 2019, according to a report by Bloomberg. Hideyuki Ando, from NYK Group member Monohakobi Technology Institute, told the news agency that for safety reasons the vessel would still have a crew on standby for the voyage. The news is the latest sign that bunker saving autonomous vessels are close to becoming a reality, and as Ship & Bunker reported in May, Kongsberg Maritime AS (Kongsberg) and YARA are also eyeing 2019 to have a vessel in remote operation that is expected to be capable of performing fully autonomous operations by 2020. And in a white paper released in June, Japan's government said by 2025 it aims to have transmission technology for remote operation in place on 250 vessels. Rolls-Royce are another company actively looking into vessel automation with the Advanced Autonomous Waterborne Applications Initiative (AAWA) project that also includes ferry operator FinFerries and dry bulk cargo ship operator ESL Shipping. While much has been made of their potential to improve safety, another consequence of autonomous vessels is they will use less fuel. Rolls-Royce estimates by doing away with the infrastructure necessary for humans on a ship, bunker consumption could be reduced by 15 percent.